What creates that special chemistry between two people? Are there people that you instantly like . . . or dislike? Why are you more compatible with some people than others? Are you wondering if he/she is The One? 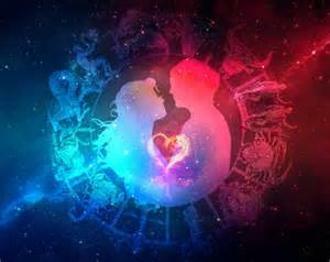 Synastry, or the astrology of relationships, can give you insights into these and other questions. With synastry, we compare your chart with the chart of another. By plotting out the planetary connections between your charts, we can determine levels of compatibility. You will discover the strengths within the relationship, as well as problem areas that may need attention. Chart comparisons can be done for any type of relationship: Romantic/marriage; parent/child; boss/employee; friend/friend; business partnerships or any other relationship you desire to understand more deeply. Also included in this consultation is your Composite Chart. The Composite Chart is an blending of your two charts into one: the chart of the relationship itself. With this chart you can see the purpose of the relationship and how your energies merge. With astrology, you can learn to flow in your relationships with greater ease, awareness and love.